I love dips. All kinds of dips. Specifically cheese dips. Have you checked out my Swiss Cheese Bread Dip? Talk about one seriously intense cheese dip. This Feta Dip is like Swiss Cheese Bread Dip's lighter, more refreshing and much less artery clogging cousin. When I saw this dip on Pinterest via Cooking On Clover Lane, I was worried that compared to the cheese dips my family is use to (among others would be Swiss Cheese Bacon Dip and Velveeta Salsa, really light sounding huh?) this dip would be too bland or mild tasting. I was so wrong. I was in a pinch for an appetizer to bring to a dinner party this weekend and the weather was so hot that I could not fathom turning on the oven or stove top. 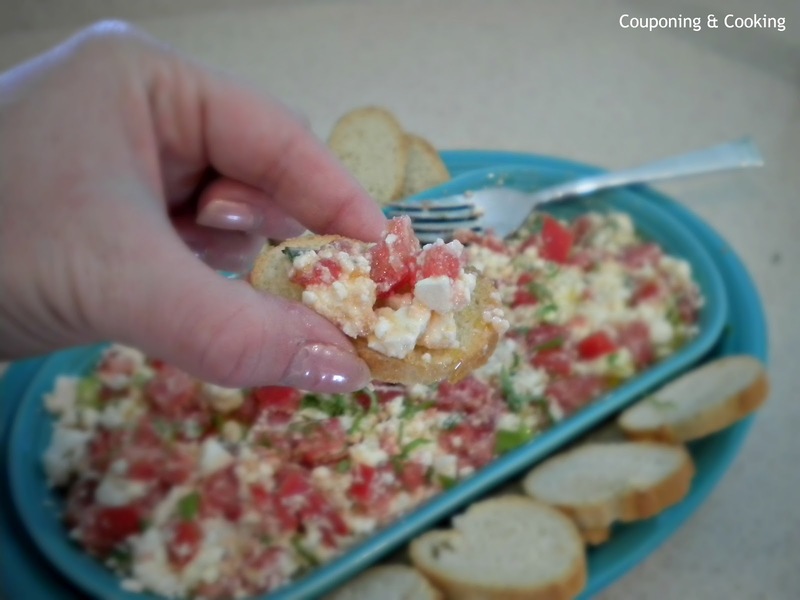 I also had lots of feta on hand from some great couponing sales so I decided to give it a try. With only four main ingredients and about as many simple steps to making it, you can't mess this dip up. It was so light and refreshing and went perfectly with the summer weather and white wine. I took the original recipe creator's advice and made sure I used Cavender's Greek Seasoning and good fresh bread to serve it with and I really think it made all the difference. The scoop and the grab methods respectively. However you choose to eat it, this dip is something you will be making again and again throughout the summer and the rest of the year. It has only been three days since I first made it and Justin is already asking me when I am going to make it again. This seasoning really does make a difference! 1.) Wet your serving dish with olive oil. You will want a light layer that completely covers the dish. 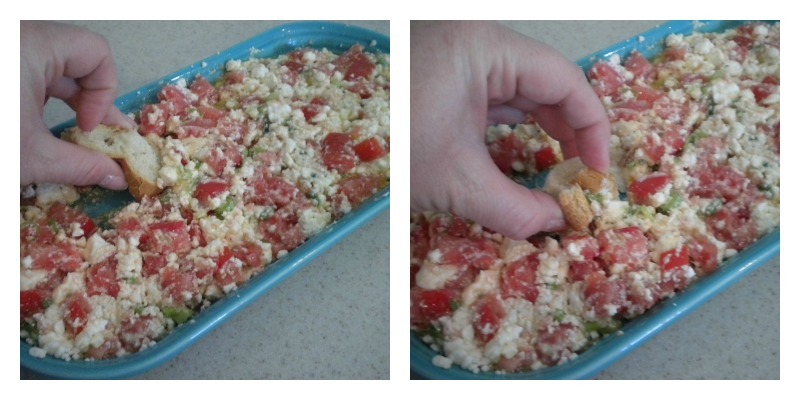 Then add your chopped tomatoes, layer the chopped green onions and feta on top of that. 2. Lightly season with Cavender's and then gently combine everything with a fork making sure the olive oil is completely incorporated into the rest of the ingredients. I went light on the seasoning at first and then added more to taste. 3.) Top with fresh basil and some more chopped green onions for color and presentation. Serve with thinly sliced pieces of fresh bread. This looks so good! Definitely my kind of snack for a fun party. Thanks! Oh my Kaylee!! That dip looks fabulous! I'm saving it for the next get together I go to! Looks amazing, but how about adding a little Greek yogurt, lemon, and cucumber. That'll amp up the richness while maintaining the cool, refreshing feeling. Sounds very tasty, I'll give this a try! That looks so good, I'd love to stuff that in a pita with some hummus! Thanks for linking, I appreciate it! I will use this for parties this summer! Love it and thanks for linking up! These flavors sound great together. Such a nice summer dip! 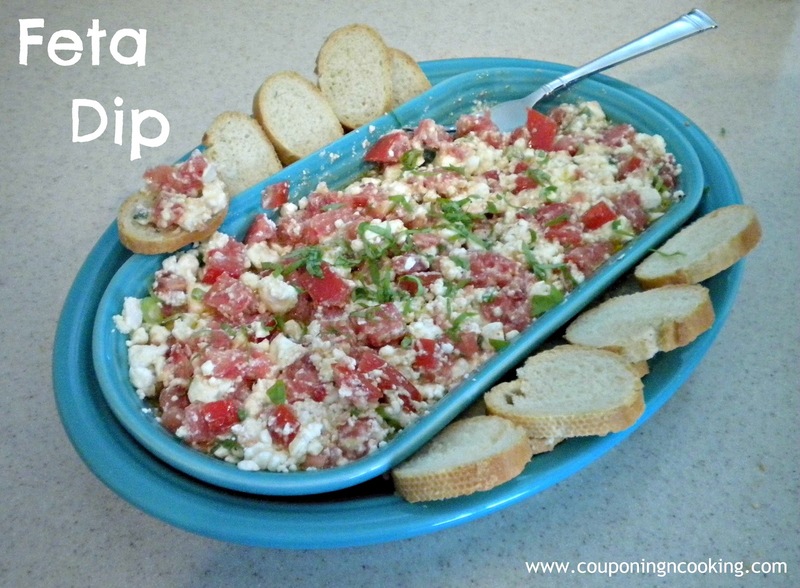 I love feta and always serve some sort of dip when we have a party. Usually always the same ones.....guacamole, hummus or salsa. Lol. I'll have to try this one for our next party. This looks so yummy, I love feta. I bet this would even be good dip for veggies. I am now following and found you via 'Mingle With Us'. 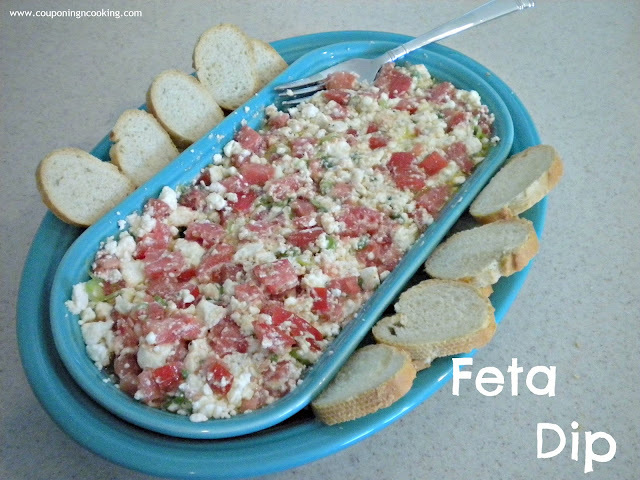 I am a huge feta fan so this looks absolutely yummy to me. I completely enjoyed your demonstration of both civilized and not so civilized eating techniques. Thanks for sharing at our party this week. This looks soo good. I would love to have this for a light summer dinner on the patio. Thanks so much for sharing the recipe! Oh yum! I love anything with feta. Oh who am I kidding! I love any kind of cheese! That looks so good! Thanks for linking up to the Pomp Party! Pinning to our Pomp Party board! This could be a whole meal for me, it looks awesome! Hope you have a great week end and thank you so much for sharing with Full Plate Thursday. Wow! That sounds amazing! Yum! Thanks so much for sharing this as well at Thursday's Temptation. YUMMY!! Thanks for sharing at SweetTalkin' Sunday! I've pinned for future use!! I love feta! It's one of my favorite cheeses. Will definitely keep this in mind next time I have to take an appetizer somewhere. I love feta! Since we do gluten-free, I would use cucumber rounds and cut up peppers instead of the bread, though I'm sure the bread is so yummy! YUM! This looks delicious. 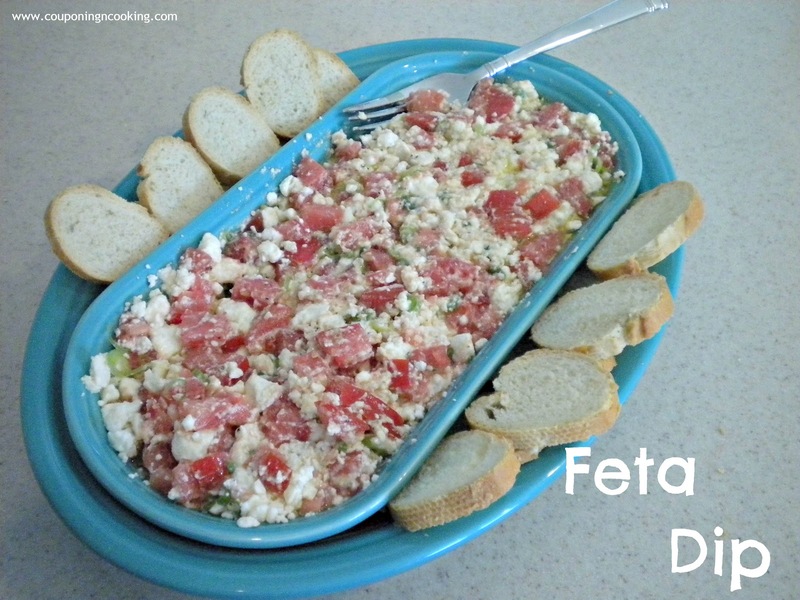 I just started eating Feta last year and am in LOVE :) Great dip for summer. Thanks for sharing at Creative Thursday. 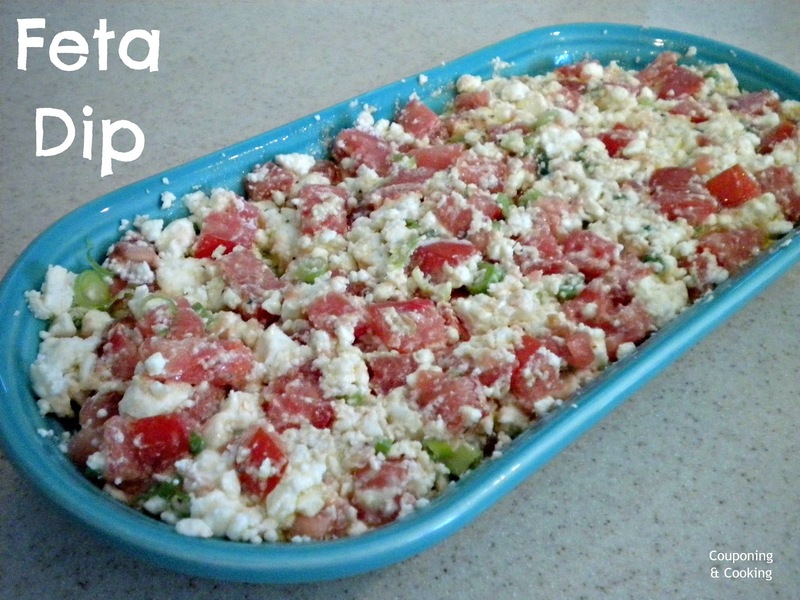 Just the word feta makes my mouth water! Looks so yummy! Thanks for linking up to The Cure for the Common Monday. Hope you stop by and say hello! 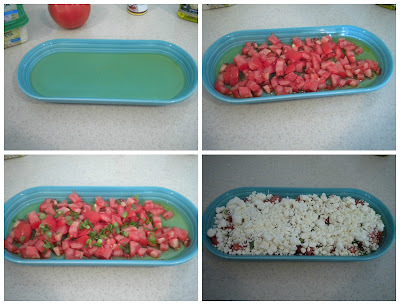 Looks tasty, easy and perfect for summer. Thanks for sharing at Terrific Tuesdays. I have recently been made aware of the tastiness that is feta cheese so this is something that will go on the To Make list. Thanks for sharing on Tout It Tuesday! Another feta fan here! This sounds like a perfect summer appetizer or light supper even. Thanks so much for sharing on Busy Monday at A Pinch of Joy. Hope to see you again soon! Another use for Cavender's. I love that seasoning mix. Thanks for bringing this to the Super Bowl Party.